An animated graphic is making the rounds right now and purportedly shows robots destroying the financial world. Unfortunately, it doesn't show that at all. Robots have taken over the financial market, and we're all going to die. Be patient, the graphic cycles through from 2007 all the way until the beginning of 2012. You'll know when you're getting near the end though, because it gets crazy! Reuters' Felix Salmon wrote: "It's certainly fair to say that if you take a long, five-year view, then you can see a clear rise in trading activity. But it's also fair to say that there's something quite literally out of control going on here. ... The stock market today is a war zone, where algobots fight each other over pennies, millions of times a second." Over at Huffington Post, Mark Gongloff breathlessly noted: "Along the vertical axis is the volume of high-frequency stock trading on various exchanges, which are color-coded. As you can see, high-speed trading was almost non-existent in 2007, but has completely blown up and overwhelmed the stock market in the past few years." I sat through the animation over and over and over again, scratching my head and wondering how in the world all of that had been concluded from this one (admittedly nifty) display. It's obvious that there's some big change going on here, but it wasn't clear to me what that change was. To figure it out, I contacted Nanex. Nanex founder Eric Hunsader walked me through exactly what we're seeing here. What Nanex has done is compare the number of quotes versus trades that are happening each second. Since high-frequency trading (HFT) programs like to search out trading opportunities by flooding exchanges with quotes -- that is, quick pings with buy/sell prices, but not actual trades -- a high ratio of the number of quotes versus trades indicates that an HFT program is at work in a particular stock. This is even more apparent when measured on a per-second basis, since human traders simply can't operate that quickly. So, if a ticker had a quote/trade ratio high enough -- Ding! Ding! Ding! -- there's likely an HFT there. 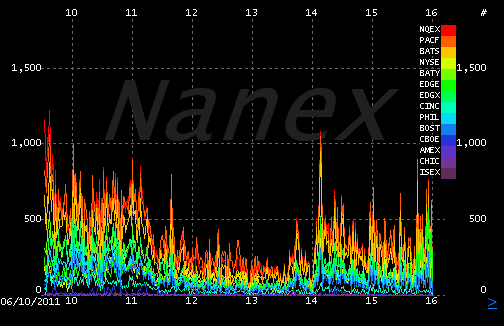 To create the graphic, then, Nanex summed up the total number of tickers with an HFT presence each minute over the entire five-year span. So what the GIF shows is the presence of HFTs across tickers in the market. As you watch the squiggly lines grow during the animation run, what you're seeing is the fact that in 2007, HFTs were trading very few different tickers. By 2012, they were transacting in a much more diverse group. What this crazy-looking screen-grab from the graphic doesn't show is the overall trading volume from HFTs. Nor does it show a destabilizing effect from HFTs. Nor does it show anything about how HFTs are harming individual investors, institutional investors, or any other investors in between. All that this shows is that over the past five years, high-frequency traders have traded in a wider variety of tickers -- between 500 and 1,000 different tickers for much of the day in the screen grab above. We could put together a very similar graphic for participation rates of pretty much any industry, trend, or product that's growing: people reading news online, iPhone users, or even the number of daily Facebook "likes." And, notably, in the post on their site, the folks at Nanex didn't claim that this showed anything more than it actually does. Whether increased participation from HFTs is a good or bad thing is up for debate, as is whether steps need to be taken to limit the activity of HFTs. And that's a debate that needs to happen, but it needs to happen based on solid facts and a good understanding of what's really going on. This particular graphic, however, was assigned meaning that was never actually there. To me, this suggests a high level of fear (whether warranted or not) of HFTs, a lack of understanding of what HFTs are doing, journalistic laziness, or, probably, a bit of all three.